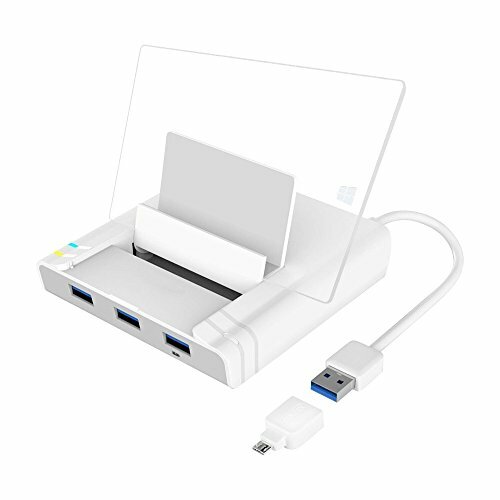 UNITEK Universal Mutil-fuction Dock is a brand-new docking station for your Microsoft Surface 3, Andriod Phone / Tablet or Ultrabook via OTG adapter (Tablet must support OTG function). Instantly transform your ultra-portable tablet or mobile phone into a complete desktop workstation and easily connect to your favorite accessories. Just connect your tablet to the dock, add a mouse and keyboard, plug in the Ethernet cable for internet, it's like a desktop computer. With an Ethernet port & three USB 3.0 ports&you can attach your full-size keyboard, printer and more, bring full Ethernet functionality to your surface quickly. It perfect for the living office, study, room, bedroom, dorm or virtually anywhere. Enjoy yourself, emailing, movies and playing games. Note: Android tablet PC cannot have access to Ethernet function. Only Windows tablet PC can recognize the driver and use it. Three USB 3.0 ports let you connect various USB peripheral devices, such as keyboard, mouse, USB flash drives and hard disk, etc. If you have any questions about this product by Unitek, contact us by completing and submitting the form below. If you are looking for a specif part number, please include it with your message.